The new Innokin Kroma-A Zenith is the advanced and ultra compact rapid response vaporizer with 75 Watts of Temperature Control Power in an Ultra-Compact 72mm design. TH UK Innokin vape kit now comes with the advanced Zenith tank. Enjoy amazing, full flavoured clouds the way you want with Innokins precise 6-75 Watt output for the best of MTL and DTL vaping! The upgraded flush 24 mm 510 connection is a perfect fit for all popular atomizers. Vape with confidence with the easy to use Temperature Control(SS316, ni200, Ti) with dry-hit protection. The Kroma-A Zenith has a real internal 2000 mAh Li-Po battery with 2 amp micro-USB quick-charge! Always be ready with Innokin’s ‘Vape While charging’ technology. What is the Innokin Zenith? The Innokin Zenith is a high tech. advanced tank vaping system. The Zenith atomizer is a collaboration between Phil Busardo, Dimitris Agrafiotis, and Innokin. The goal was to create an easy and intuitive mouth to lung (MTL) replaceable coil-head atomizer to allow an easier transition from smoking to vaping. The Zenith features an easy top fill twist design that will automatically shut off the liquid flow when filling in order to prevent flooding and gurgling, an adjustable airflow, and an easy and clean method to replace the coil. Coupled with the Innokin Zenith tank, the Kroma A device creates an excellent vape mod that is capable of producing maximum flavour and vapour for those new to vaping or advanced vapers. The Zenith tank is top filling with adjustable bottom airflow and is very low profile. The Innokin Kroma-A Zenith Vape System is powered by the smooth precision of 75 Watt Aethon Temperature Control Chip-set (SS316L, Ni-200, Titanium) which includes technology to avoid dry hits. The new standard flush 510 connector now facilitates a full range of alternative tanks and atomizers up to 24 mm diameter. The high quality bright OLED clearly displays all important information and the power and ‘+’ – ‘-‘ adjustment buttons raise or lower temperature or watts in .5 increments. The Kroma A with Zenith tank comes with many inbuilt advanced features including "Pre-boost" to pre-heat the coil to the desired temperature, puff counter, integrated cut-off safety including over-discharges auto power off, screen orientation, temperature and wattage memory settings, check atomizer feature. Other features include Stainless Steel TC mode, Nickel (Ni-200) and Titanium (Ti) modes and coil calibration. Your Innokin Zenith device is manufactured with precision so will not leak providing you use the product and parts correctly. Where any leaks have occurred, we have solved almost all by taking the following steps. First things first - the Innokin Kroma A Zenith mod is a sub ohm device, generally for safer vaping use only 0.3 or 0.6 mg strength nicotine. It is also important to ensure you obtain the correct temperature to vape a given e liquid. Different e liquids have different properties so some need a higher temperature and some a lower temperature. In order to get the "sweet spot" we suggest starting your Kroma at a low setting and increase that in small steps. At some level the vapour will feel warm as you inhale and this is the approximate optimised temperature. You then need to reduce the temperature/wattage at the Zenith tank 1 step at a time and somewhere around that level you should find your precise "sweet spot. If you like a warmer vapour you can increase the power 1 or 2 watts above this point to see which you prefer and which gives the vapour level and flavour you desire. If you change e liquids or coil resistance you will then need to repeat the steps above to ensure you are getting the e-liquid at the correct vaping temperature. The Kroma A Zenith device is ideal for power-vapers. For those simply wishing to stop smoking the Kroma vape mod does not present any great advantage over the other much simpler and smaller devices available on the site. Nicotine absorption can be achieved either through high vapour + low strength e-liquid or lower vapour + higher strength e liquid. Kroma A Zenith Battery Capacity Monitoring. An excellent feature of the Kroma A Zenith kit is the colour coded voltmeter shown on the LED. Know where you stand, how much vape time is left! 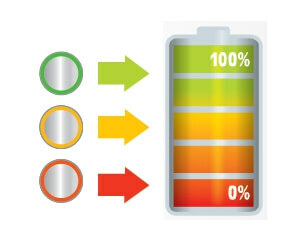 Battery capacity is displayed via green yellow and red LED. Red = Low Power - charge your Kroma A. When the Kroma A is on, hold down the power button to activate the indicator. When the Kroma Zenith kit is fully recharged the LED light will power off. Do not charge the Kroma using a car charger.